The chief minister of Sabah, one of two Malaysian states on the island of Borneo, said that the Pan Borneo Highway project should expand existing roads where possible to minimize environmental impact. A coalition of local NGOs and scientific organizations applauded the announcement, saying that it could usher in a new era of collaboration between the government and civil society to look out for Sabah’s people and forests. These groups have raised concerns about the impacts on wildlife and communities of the proposed path of the highway, which will cover some 5,300 kilometers (3,300 miles) in the states of Sabah and Sarawak. The chief minister of the Malaysian state of Sabah has called on construction crews working on the multi-billion-dollar Pan Borneo Highway project to avoid breaking up the region’s forests and other sensitive environments where possible. 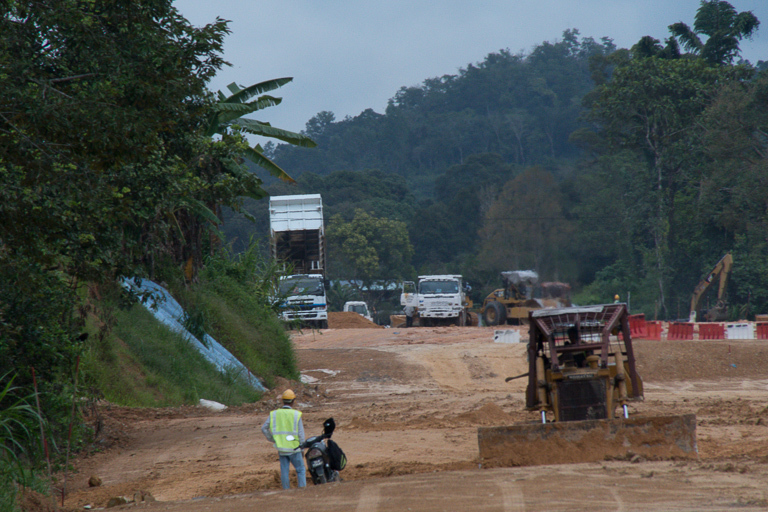 Crews level out a new stretch of the Pan Borneo Highway south of Kota Kinabalu. Image by John C. Cannon/Mongabay. Widening the roadways that are already there, instead of clearing new land for realignments, will also speed up the road’s construction, Shafie added. A group of NGOs and scientific organizations in Sabah called Coalition 3H, short for Humans Habitats Highways, applauded the chief minister’s support for protecting Sabah’s forests in a statement, published March 25 in full by The Borneo Post newspaper. Benoit Goossens, a biologist who directs the Danau Girang Field Centre in Sabah, said Shafie’s stated position on the Pan Borneo Highway was a “big relief,” according to the statement. Danau Girang is a Coalition 3H member. A two-lane road along Sabah’s northwest coast would cut through delicate mangrove forests, conservation groups say. Image courtesy of Coalition 3H. In recent years, work on the Pan Borneo Highway began as part of a multi-year project to develop and upgrade the “transportation backbone of the states of Sabah and Sarawak.” The project aims to construct or expand nearly 2,100 kilometers (1,300 miles) of asphalt highway across the two states by 2025. From the outset, however, as crews began clearing land and grading pathways for the road, scientists and conservationists raised concerns about the areas that would be affected by the planned route. 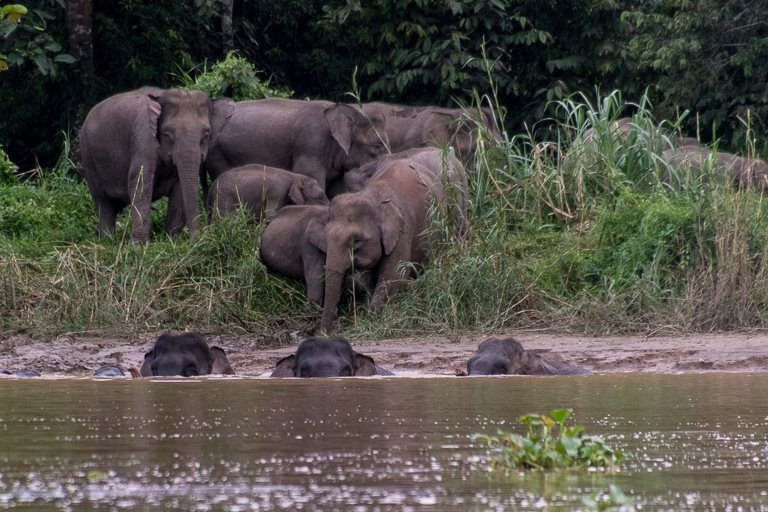 A herd of elephants crossing the Kinabatangan River in Sabah. 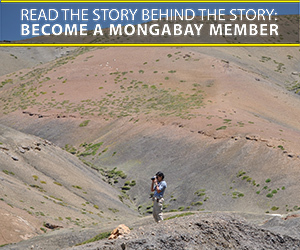 Image by John C. Cannon/Mongabay. 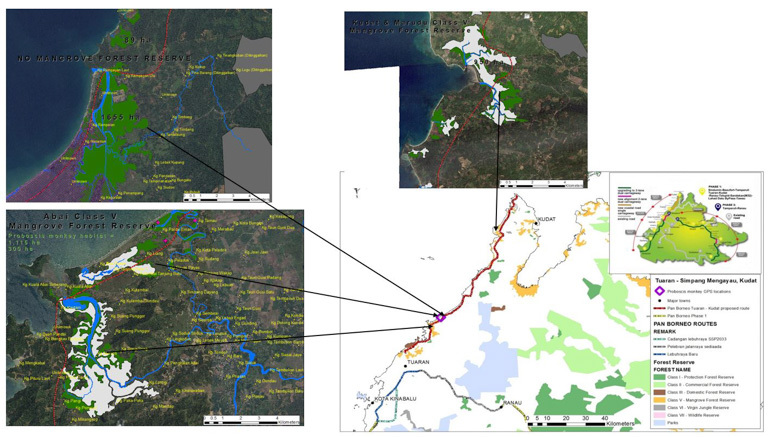 Coalition 3H pointed to a proposed length of road between Tauran and Kudat that would carve through the sensitive mangrove forests in northwestern Borneo. Mangroves are vital nurseries for fish and other sea life, many species of which are important to local fishers. It’s also the last place on that part of the island where IUCN-listed endangered proboscis monkeys (Nasalis larvatus) live. The monkeys, named for their prominent noses, are a huge draw for tourists, in addition to being protected under Malaysian law. Elsewhere, in the Tawai Forest and around the Kinabatangan River, the planned route would slice through the favorite haunts of Borneo elephants (Elephas maximus borneensis), the coalition said. New or wider roads through these areas could create hazards for both the animals and motorists, which solutions such as wildlife overpasses could remedy. “The current alignments in the hotspot areas would drastically increase human-wildlife conflict during and after the construction of the road and lead to a high number of collisions with animals, potentially leading to human deaths,” Goossens said. 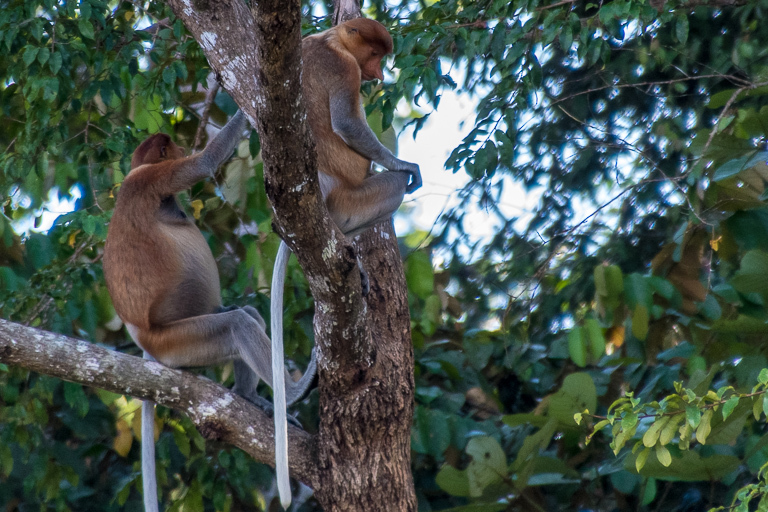 Proboscis monkeys draw tourists to Sabah, but the mangrove forests they inhabit in northwestern Borneo could be damaged by the construction of the Pan Borneo Highway as currently planned. Image by John C. Cannon/Mongabay. The coalition also called for more open consultations with communities living in the areas impacted by the construction. Ensuring that the Pan Borneo Highway benefits Sabahans is one reason that Shafie decided that the government, not private contracting “partners,” should oversee construction, the chief minister said. Shafie said he and Malaysia’s works minister, Baru Bian, agreed on government oversight as a way to speed up the project’s timeline. However, The Edge Markets reported March 22 that Mohd Anuar Mohd Tahir, Malaysia’s deputy works minister, said the country’s cabinet would make a final decision on the involvement of private-sector partners by the end of March. 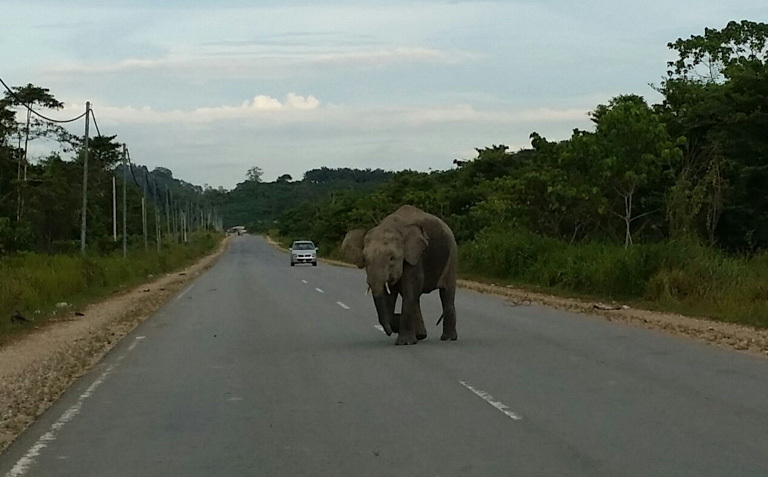 A Bornean elephant crosses a two-lane road in the Kinabatangan region. Image courtesy of Coalition 3H. Baru Bian recently drew praise from conservationists after he said that projects such as hydropower dams must take into account how they affect the environment and local communities, at an energy conference in Sarawak on March 16. In Sabah, Shafie’s support for protecting forests, people and wildlife could strengthen the state’s role as a leader in sustainability and conservation, said Cynthia Ong, chief executive facilitator at the NGO Forever Sabah. 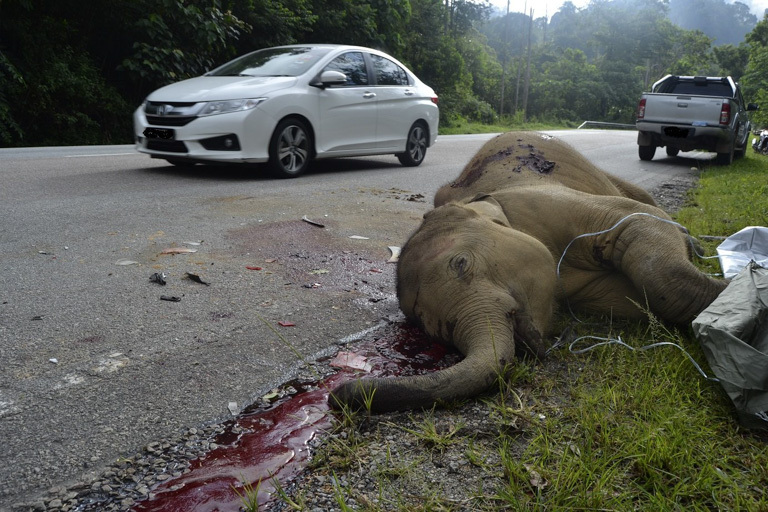 A baby elephant killed in a traffic accident on a highway in Peninsular Malaysia. Image courtesy of Coalition 3H. Banner image of proboscis monkeys (Nasalis larvatus) in a cleared mangrove forest courtesy of Coalition 3H. Meijaard, E., Nijman, V. & Supriatna, J. (2008). Nasalis larvatus. The IUCN Red List of Threatened Species 2008: e.T14352A4434312. doi:10.2305/IUCN.UK.2008.RLTS.T14352A4434312.en. Downloaded on 26 March 2019.